Word is that director Quentin Tarantino was arrested for stealing an Elmore Leonard novel when he was just 15. If so, it comes as no surprise that when he finally got to adapt and direct another of the author’s books (‘Rum Punch’), he did so with such a deft touch. 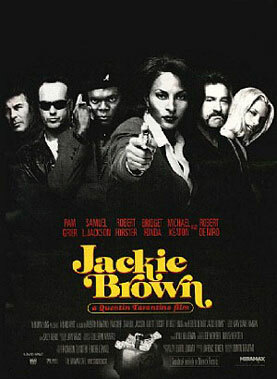 The titular Ms Brown (Pam Grier) is da coolest of da cool. She may be a 44 year old stewardess on one of the dodgiest airlines flying between LAX and Carlo San Lucas in Mexico but this babe knows her onions. Unfortunately, her wage doesn’t quite buy her the sort of lifestyle she aspires to so she resorts to a bit of money smuggling on the side. When she’s caught red handed by the cops, she has to use all her wily ways to concoct a scheme that not only guarantees her freedom, but ensures that she’s set up for life. With police agent Ray Nicoletta (Michael Keaton) on her tail and hit man Ordell (Samuel L. Jackson) even closer, Jackie enlists the support of her bond bailsman, 56 year old Max Cherry (Oscar nominated Robert Forster), who developed a soft spot for her the moment he clapped eyes on her fine form sauntering out of the cell. With these two worldly bods in partnership, it could be the perfect heist, but there are a few loose cannons to contend with, namely Ordell’s pot-head, surfie chick girlfriend Mel (a stunning Bridget Fonda) and the dopey, recently released bank robber, Luis (Robert de Niro). Pam Grier is nothing short of sensational, strutting around in her tight little blue uniform and flagrantly smoking where it’s clearly forbidden. Grier was a huge star in a series of ’70s blaxploitation films like Coffy, Foxy Brown and Sheba Baby, but Jackie Brown lays all those tough chicks to rest. Apart from all these uber slick performances and the immaculate, rhythmic dialogue, the music is a stand-out feature in this film, beginning and ending with Bobby Womack’s ‘Across 110th Street’. So if you’re in the mood for some more top notch heist action after seeing this week’s box office standout Inside Man, grab a copy of this Tarantino gem. It may just be his best yet.